Today was the first day of Memorial Day Weekend, and Steve pointed out that we might have problems finding a place to camp at the state parks. We went ahead and called the Rough River Dam State Campground where we were all hoping to stay and were told that indeed all their spots were reserved. Most days I haven't been making any great effort to secure my lodging until I am almost upon it, but this news did start the day out not feeling quite right. Our best plan was to show up at the campground looking tired and thirsty and hope they had a patch of grass for us to pitch our tents. Because I had missed my mail drop the day before I had to part from the other cyclists and head back to Buffalo to get it. The four others weren't traveling together per se, but all five of us had the same destination in mind for the night. After I picked up and sorted my mail and goodies I estimated that I was about an hour behind everyone else and I didn't expect to see them until later. Steve and Linda began their jouney five days after me, Larissa and Bertÿn started eight days after me, so I am easily the slowest cyclist of the bunch. The riding day passed without any great hills or headwinds to hold me back. At one point while I was riding I spied a mother dog with two puppies alongside the road barking at me. I waited until I was almost within lunging distance from her, then I hollered out a "Git!" to distract her. She and her puppies all scattered into a drainage ditch and I thought that would be the end of it. But shortly after I passed her I looked down and she was running quietly alongside my bike. I thought that she was hoping I would give her some sort of handout, but even when no food was forthcoming she continued to run along with me. She must have followed me for over fifteen minutes and I was beginning to wonder if she was coming all the way to Oregon when abruptly she stopped and headed back to from whence she had came. Perhaps she suddenly recalled she had puppies to feed. Steve and Linda had been expecting to meet with another couple from Wisconsin and I came across the four of them picnicking on the side of the road. I stopped to chat and have a cookie, then continued on my way. Their friends ended up carrying Steve and Linda's panniers ahead in their car, so when the tandem cyclists passed me they left me behind like a rocket. Normally they are probably traveling 2 mph faster than me, but with them being unloaded I couldn't do anything except watch in amazement as they powered over the biggest hill of the day. 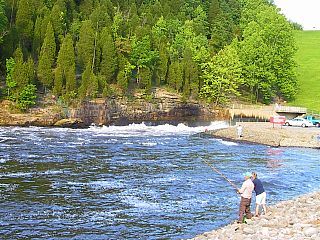 When I arrived at the Rough River Dam I found that the two Wisconsin couples had secured one campsite, and that Bertÿn and Larissa had secured another that I could join them in. We cooked our dinners and finished eating just as a thunderstorm broke driving us into our tents. This was the first big storm that I had managed to completely wait out in my tent and it was pleasant to read my mail while the fat raindrops tumbled down outside. Unfortunately, just as the storm cleared two of the campsites next to us were taken by five carloads of rowdy teenagers. I'm sure I've been as loud and obnoxious in my camping history, but at least when we have our annual outing in Nevada we go far enough into the desert that we only offend ourselves. I was mildly embarrassed to have our Dutch visitors see this side of American behavior, but I suppose that youth gets out of hand all over the world.